The annual Conversations with Bob Mundheim series, welcomes its first guests, the Gogo Inc. Board of Directors, on Monday, March 18. 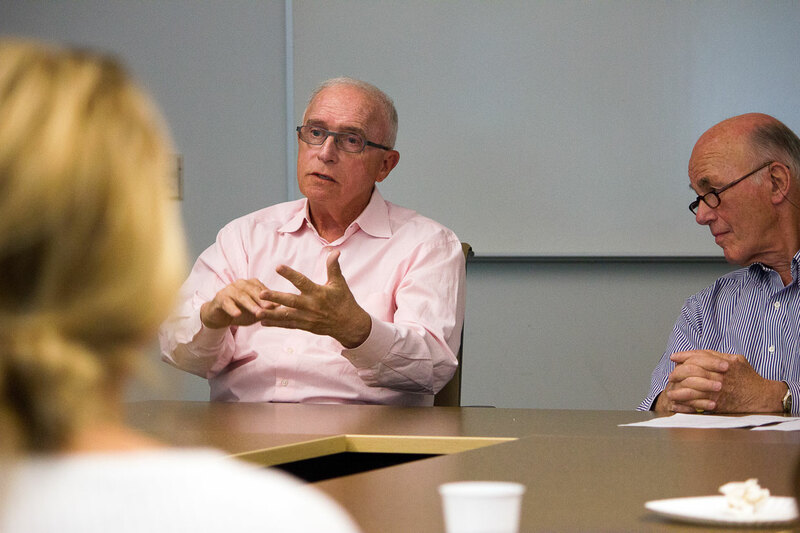 The series features Professor of Corporate Law and Finance Bob Mundheim moderating informal conversations with national leaders in business and law, relating their experiences in and perspectives about corporate governance, markets, ethics and career development. The series is free and open to the public and will be of particular interest to law and business students. All sessions take place noon-1:15 p.m. at the College of Law, Room 237 (Faculty Lounge). Lunch is provided, and seating is limited. He serves as Managing Director and Co-Founder of OpenAir Equity Partners as well as Chairman of many of its portfolio companies. OpenAir Equity Partners specializes in “Internet of Things” and related data science investments with portfolio companies that focus on connected car, home, aircraft and ag machinery businesses. He has over 46 years of experience in the wireless industry and his unique expertise has helped place OpenAir Equity Partners portfolio companies at the forefront of transformation. Previously, Ron served as President – COO of Sprint. As the first employee and CEO of Sprint PCS, Ron guided the company from start-up to $10B in annual revenue faster than any company in U.S. history. Mayes is vice president, general counsel, and secretary for the New York Public Library. Previously, she served as executive vice president and general counsel for Allstate Insurance Company. She served as a senior vice president and general counsel of Pitney Bowes Inc. (2003–07) and in several legal capacities at Colgate-Palmolive (1992–2003). In 1982, Mayes entered the corporate sector as managing attorney of Burroughs Corporation, and then was staff vice president and associate general counsel for Unisys Corporation worldwide litigation. From 1976 through 1982, she served in the U.S. Department of Justice as an Assistant U. S. Attorney in Detroit and Brooklyn, eventually assuming the role of Chief of the Civil Division in Detroit. She currently chairs the American Bar Association’s Commission on Women in the Profession. Knight served as General Counsel of the U.S. Department of the Treasury from September 1994 to June 1999, where he was the Department's longest-serving General Counsel. He serves as a Trustee of the University of Texas Law School Foundation, is a member of the Advisory Board of Columbia University’s School of International and Public Affairs and is also a member of the Council on Foreign Relations and its Committee on Corporate Affairs. He sits on the Leadership Board of the U.S. Chamber of Commerce Center for Capital Markets Competitiveness serves on the Board of Nasdaq Dubai and the United Arab Emirates’ Securities and Commodities Authority Advisory Board and served as a member of the Obama Transition Team at the U.S. Treasury Department in 2008-2009. Lorne oversees Millennium Management's compliance, legal, regulatory, and internal audit functions. Previously, Lorne served as a partner at Munger, Tolles & Olson. In 1996, he became a managing director at Salomon Brothers, where he served as global head of Internal Audit. From 1993 to 1996, Lorne was the general counsel at the U.S. Securities and Exchange Commission. He is an independent director of Teledyne Technologies Inc. and Chairman of the Alternative Investment Management Association. Specializing in crisis management, cross-border government investigations and complex financial litigation. He retired from Deutsche Bank in 2016 after over 14 years, during which time he served in the roles of Vice Chairman, General Counsel and a member of the Group Executive Committee at different times. Prior to joining Deutsche Bank, Mr. Walker was with the Securities and Exchange Commission, serving as the Director of Enforcement (1998-2001), General Counsel (1996-1998) and Regional Director of the Commission’s Northeast Regional Office (1991-1995). He is the only person in the agency’s history to have served as both General Counsel and Director of Enforcement. Prior to joining the Commission, Walker spent 15 years at Cadwalader, Wickersham & Taft, where he was a litigation partner specializing in corporate, securities, and commercial litigation. Grossman is senior counsel to Grossman LLP, a litigation boutique focusing on art related matters. He is also senior counsel to Pomerantz LLP where he previously served as managing partner. He has tried and argued cases in federal and state courts across the country including the United States Supreme Court. He has been active on various committees of the Association of the Bar of the City of New York. Grossman has served the on boards of various civic organizations including the Lincoln Center Institute for the Arts in Education and the Appleseed Foundation. He was also on the Council to the Dean of the Brooklyn Law School where he was honored in 2012 as Alumnus of the Year. In his practice, he focuses on all aspects of compensation and benefits, including ERISA and corporate, securities, bankruptcy, employment, and tax laws. He has extensive experience in executive compensation and corporate governance matters, Dodd-Frank and Sarbanes-Oxley, and the compensation issues raised in the mergers and acquisitions context. Cannon joined Shearman & Sterling in 1985 and became a partner in 1994.